Namaya Productions Inc. is pleased to announce the launch of Vermont Art Poetry (VAP). VAP's debut product line is Vermont My Home, a series of photographs with poetry of rural Vermont in the four seasons that celebrates the Green Mountain State. The Namaya-Shafford series is a sensuous fusion of watercolors and poetry in collaboration with the artist Brian Shafford. 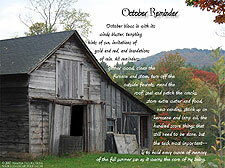 Vermont Art Poetry began in 2004 with the Vermont Art Poetry Fusion project, and out of this came a beautiful hand-pressed flower book by Linda Kwiatkowski with the poem "One Hundred Flowers"; banners and posters of this are available online. The new book of poetry Blue Heron Pond: Love Song for the Planet will be released through Vermont Art Poetry Press in the near future. Leading the production team is performance artist Namaya and Justin Looper, a talented graphic artist and computer animator. This duo is utilizing all areas of internet marketing through Café Press, You Tube, blogs, and the VAP website at www.vermontartpoetry.com. The mission of Vermont Art Poetry and its future incarnation, Vermont Art Poetry & Music, is to serve as a crucible and marketplace for many different kinds of Vermont artists. A portion of the proceeds from VAP product sales benefits the not-for-profit Third World community development organization Grace Cares -- see www.gracecares.com. VAP products are designed and produced in Vermont to support local artists. Vermont Art Poetry products are on display at Blue Moose on High Street in Brattleboro and are also available for purchase online at www.vermontartpoetry.com.